In 2010, advertising expenditure by telecommunications operators dropped 13.57% compared to the previous year, down to €854.10 million. This decrease was mainly due to the reduction of 24.8% in advertising by mobile telephony operators. The advertising expenditure by mobile telephony operators represented 54.8% of the total expenditure in the sector. Movistar was the operator that contributed the most to the total advertising expenditure, with 22.5% of the total. It was followed by Vodafone with 21.1% and Orange with 11.1%. With regards to fixed telephony operators, Telefónica Spain was the one that spent the most in advertising with 15.2% of the total, followed by Ono with 5%. 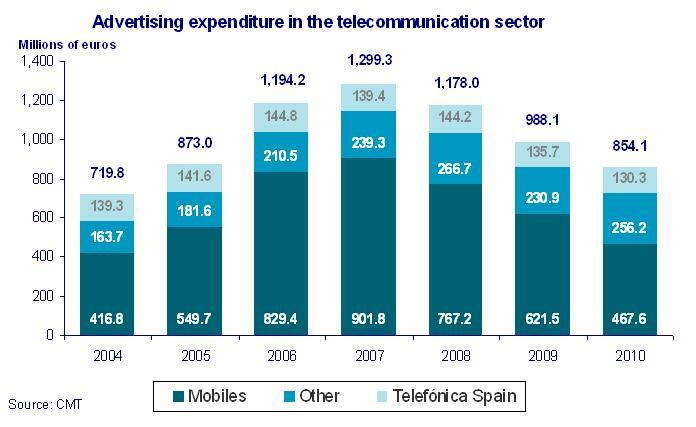 Advertising expenditure broken down by operator: Telefónica Spain, mobile telephony operators and other operators.